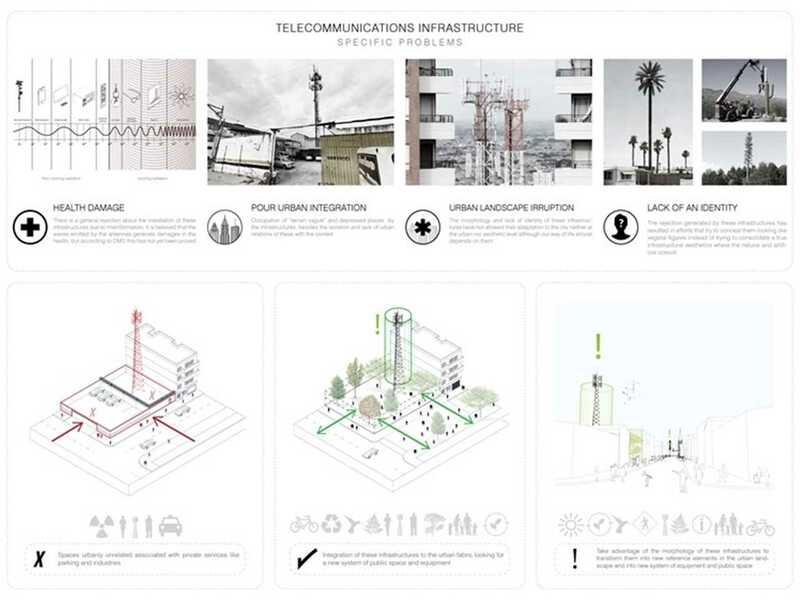 The project seeks to generate a network of public space and small-scale facilities based on the intervention of telecommunication infrastructures and the places they occupy; these are currently urban islands which are restricted to pedestrians for administrative and technical reasons. 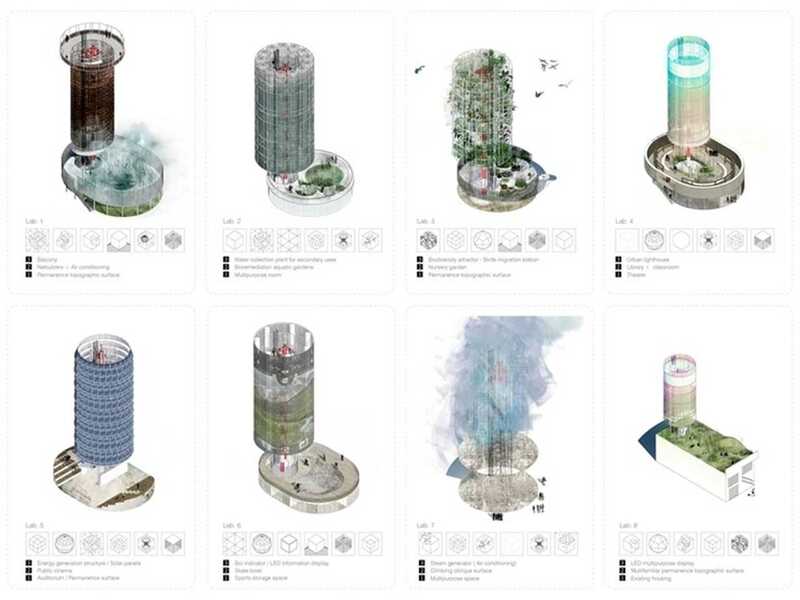 Through the creation of replicable models, we strive to compose new landscape units integrating these infrastructures in social, cultural, iconic, environmental, landscape, architectural and urban tissues. We intend to provide a local solution to the global problem of the proliferation of telecommunication towers by integrating the sites associated with these artifacts into the city, thus fostering cultural exchanges, restoring ecosystems and biotic connections, providing alternative energy systems and creating new facilities around them. Both the intervention of existing infrastructures and the identification of future insertion sites are beneficial to ensuring proper growth. 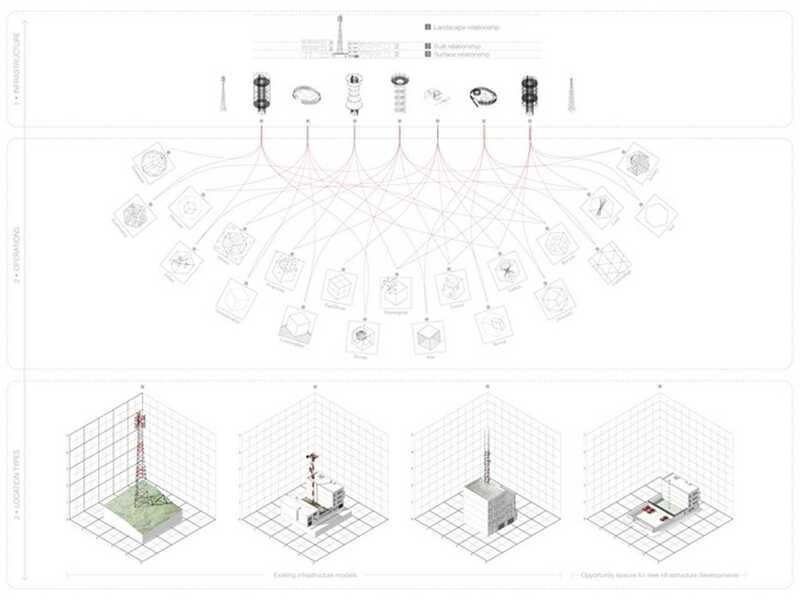 Identification of specific problems and intervention basic operations. 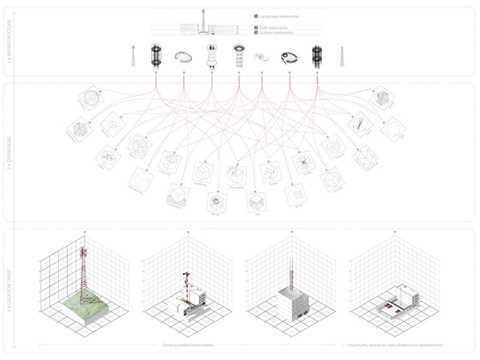 Operation and intervention matrix – Creation of a replicable system. 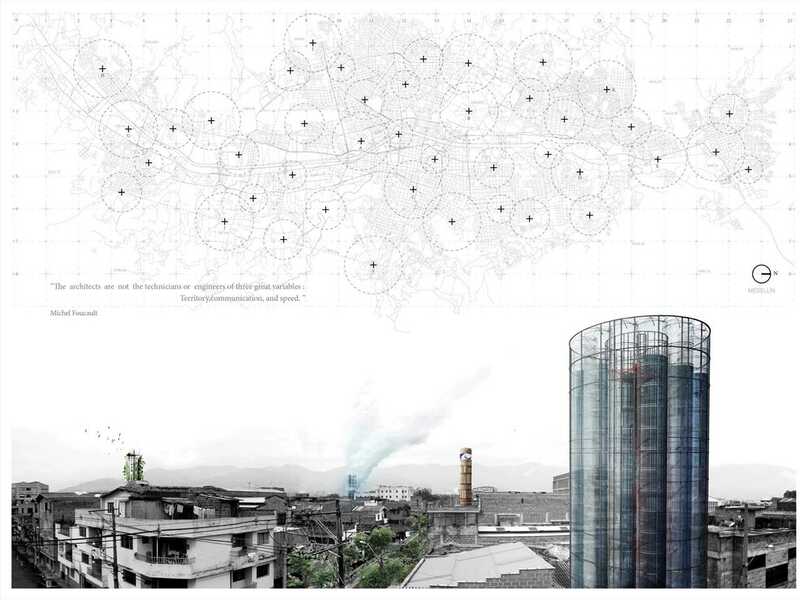 Intervention models for the integration of existing infrastructures. Verification prototype for the implementation of new infrastructures. 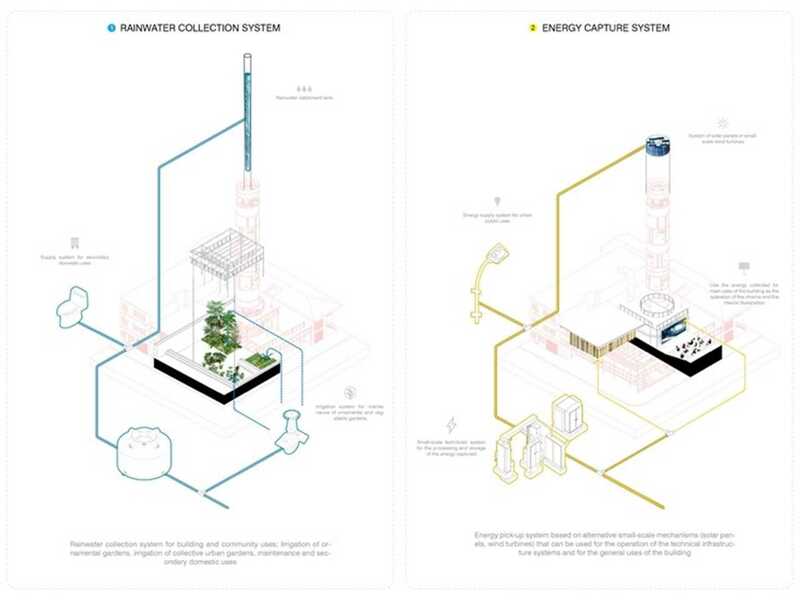 Rainwater collection system and alternative energy collection systems. 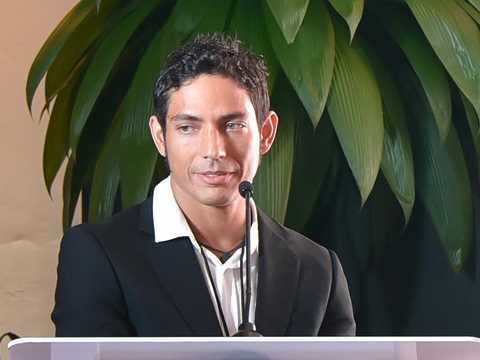 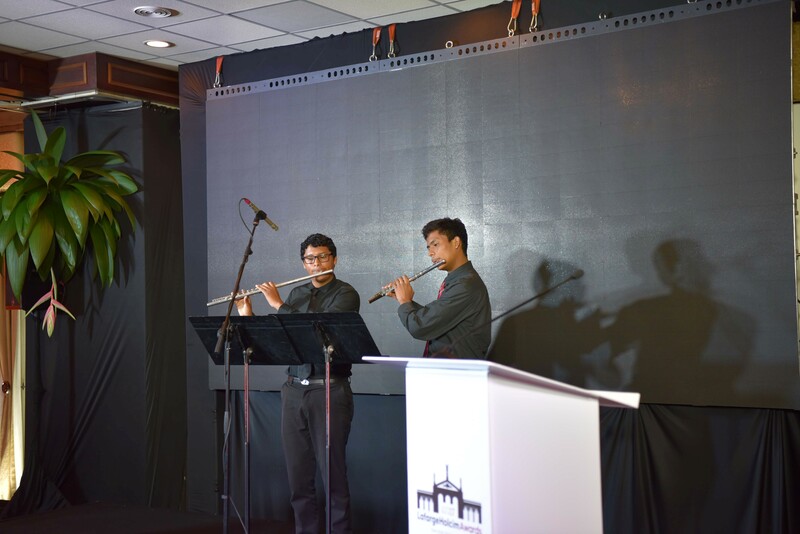 Attraction and protection of biodiversity system and telecommunications technical system. 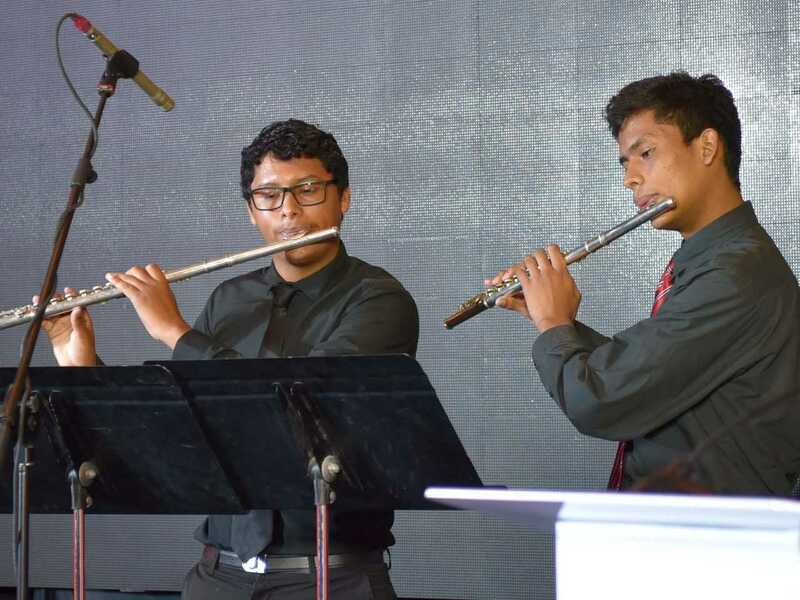 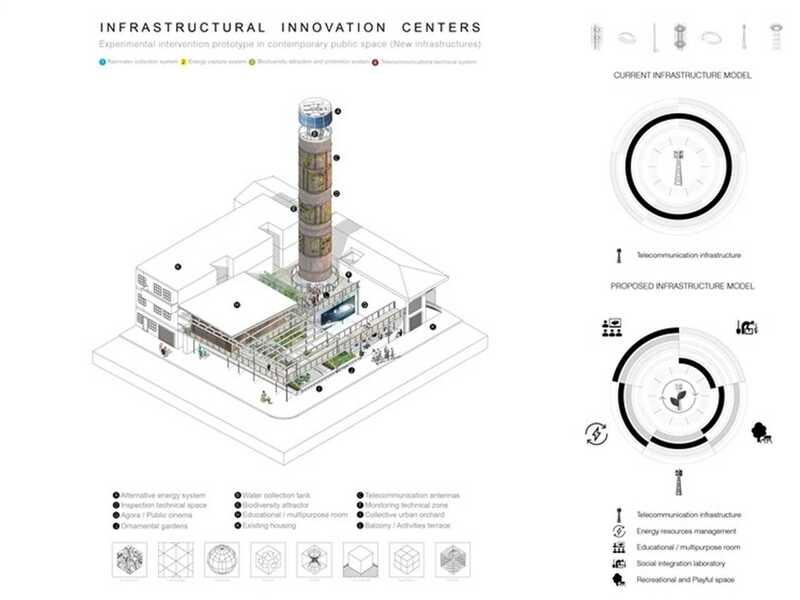 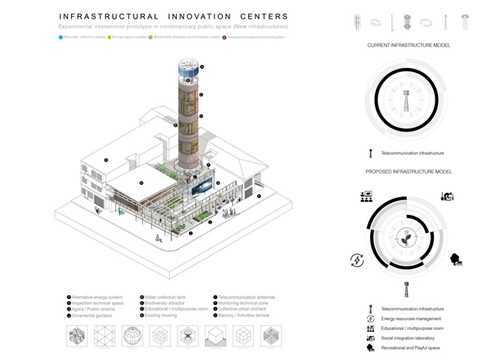 New infrastructure model promoting new spaces for social and cultural exchange. 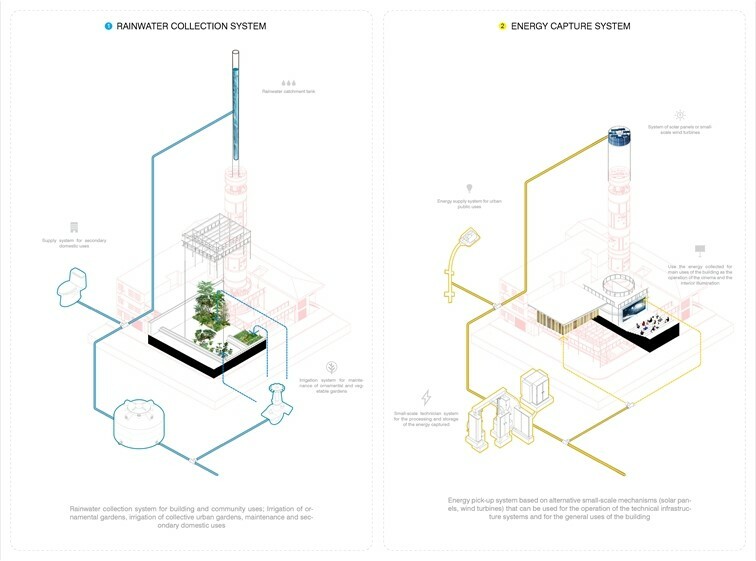 Interdependence between landscape, infrastructure, urban tissue, architecture and context. 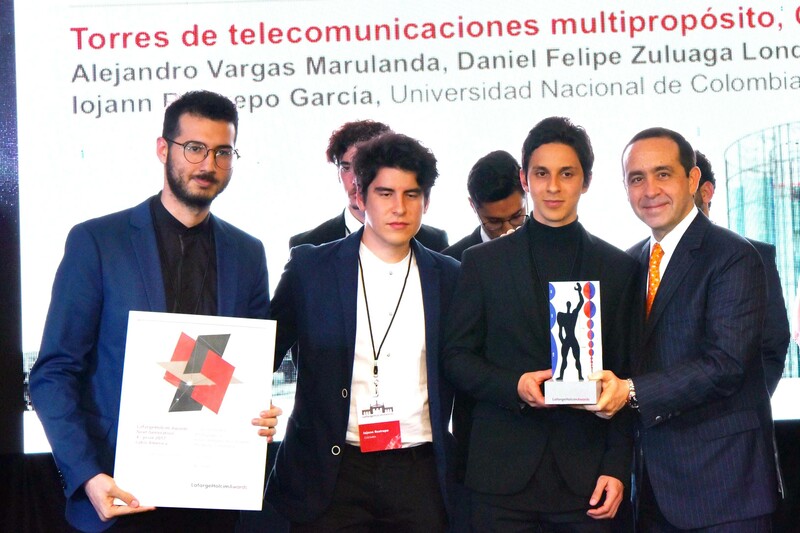 Winner of the Next Generation 4th prize 2017 for Multipurpose telecommunication towers, Medellín, Colombia (l-r): Alejandro Vargas Marulanda, Iojann Restrepo García and Daniel Felipe Zuluaga Londoño all from Universidad Nacional de Colombia – Sede Medellín, Colombia congratulated by Jaime Hill, CEO LafargeHolcim in Colombia. 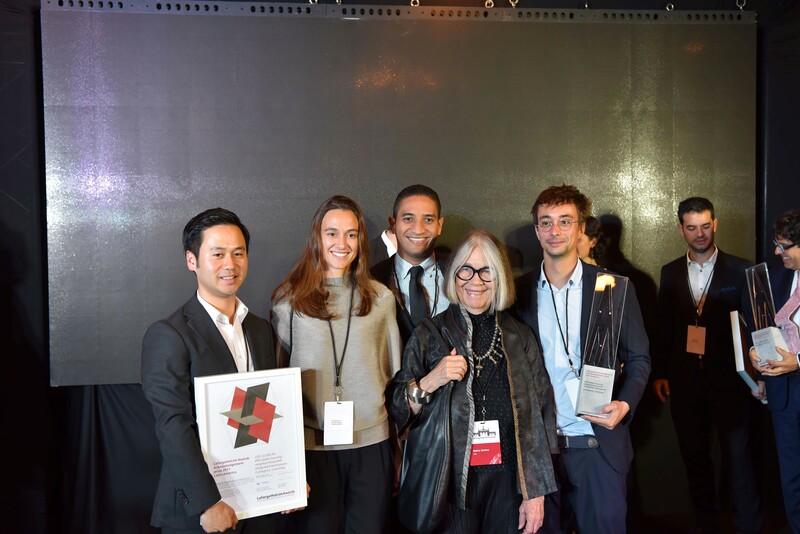 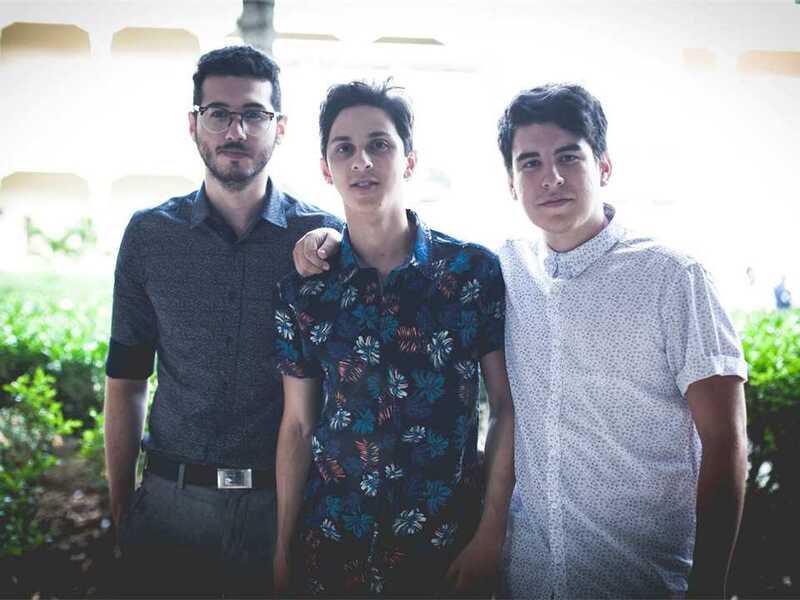 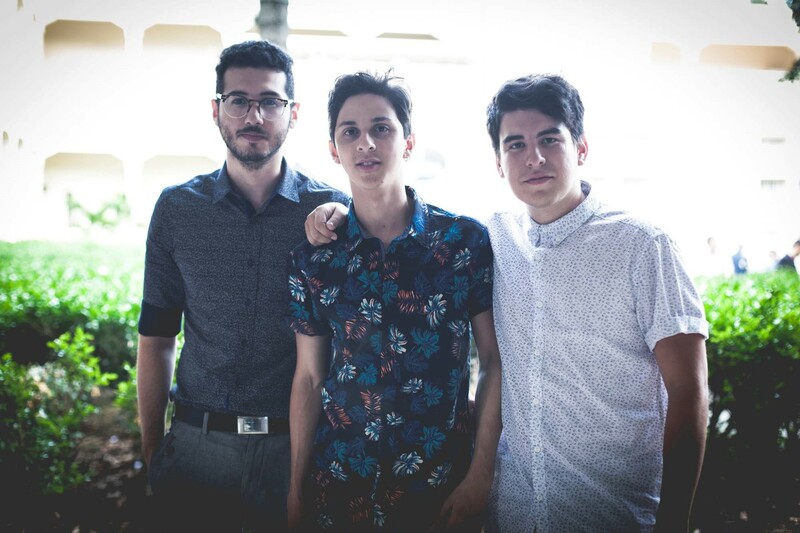 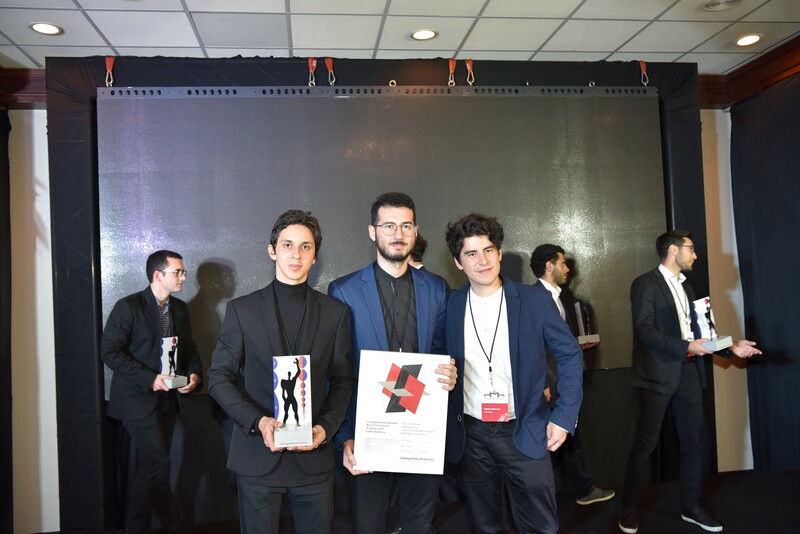 Winners of the LafargeHolcim Awards Next Generation 4th prize (l-r): Alejandro Vargas Marulanda, Daniel Felipe Zuluaga Londoño, and Iojann Restrepo García, architects, Universidad Nacional de Colombia – Sede Medellín, Medellín, Colombia. Multipurpose telecommunication towers: Network of mobile telephone telecommunication antennas incorporating multiple functions for the benefit of neighborhoods in Medellín, Colombia. The design thus seeks to generate a novel network of public facilities attached to either existing or new telecommunication towers. Nowadays, telecommunications are one of the main engines of global economic development by supporting digital relationships in the era of globalization and generating an unprecedented increase in the number of its infrastructures; This last, essential for the growing modern habits of interconnectivity. Paradoxically the communities in which these generic infrastructures are inserted, strongly refuse to live with them based on the belief that they generate health issues and that they cannot establish a relationship with the landscape nor a symbolic relationship with the territory they transform. 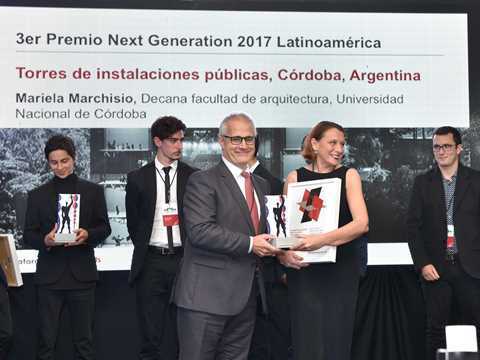 According to what is previously mentioned, how, from architecture, can we respond to these problems, improving the energetic, programmatic and environmental performance of both infrastructures and the communities associated with them? From a multidisciplinary and multi-scalar perspective this research project seeks, to propose a model that integrates these infrastructures into the contexts where they are inserted, hoping that it would be replicable, scalable and sustainable. In addition, these infrastructures would understand and adapt to the landscape (climatological, technical, iconic and cultural conditions of each place). 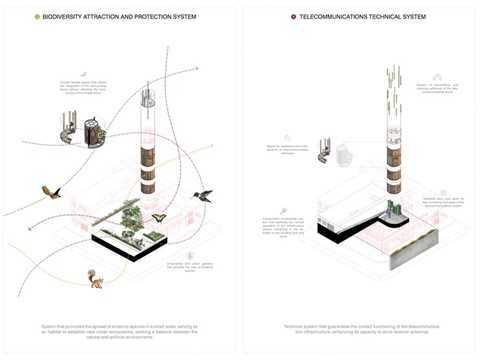 Promoting spaces for social encounters, environmental education and cultural exchange. 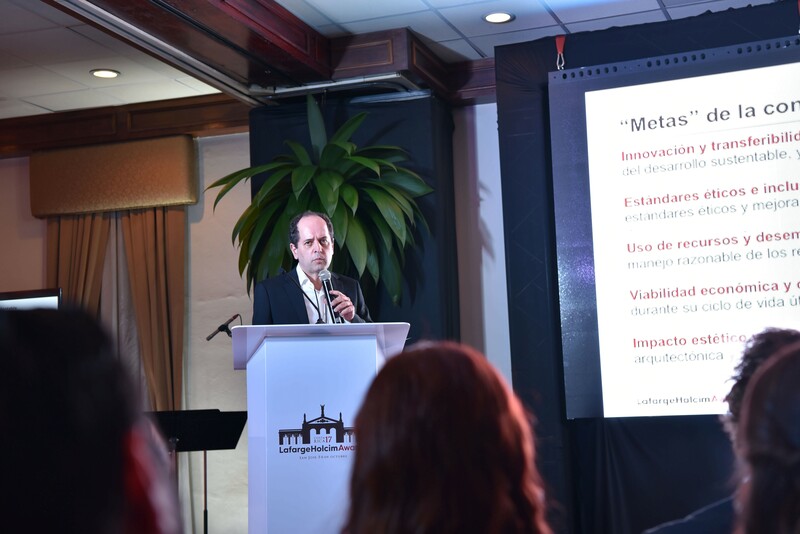 Leading to a local understanding of a worldwide problem. 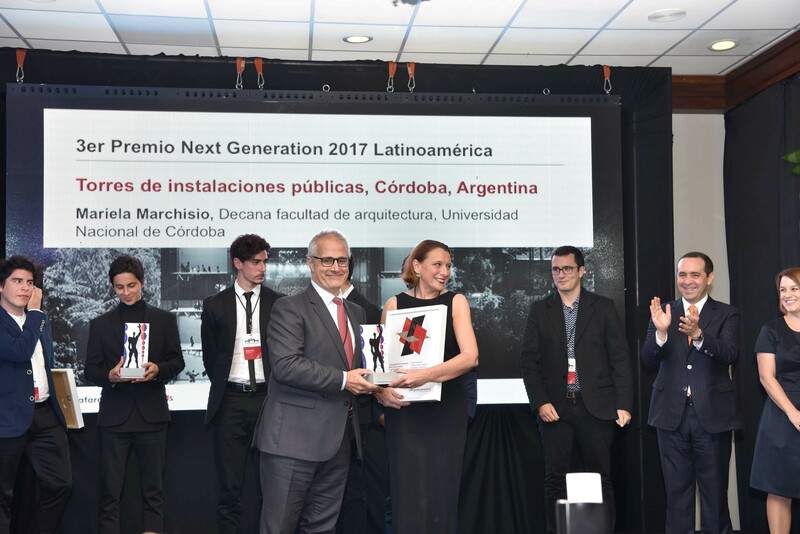 Four prizes were awarded in the increasingly popular Next Generation category for students and professionals up to 30 years. 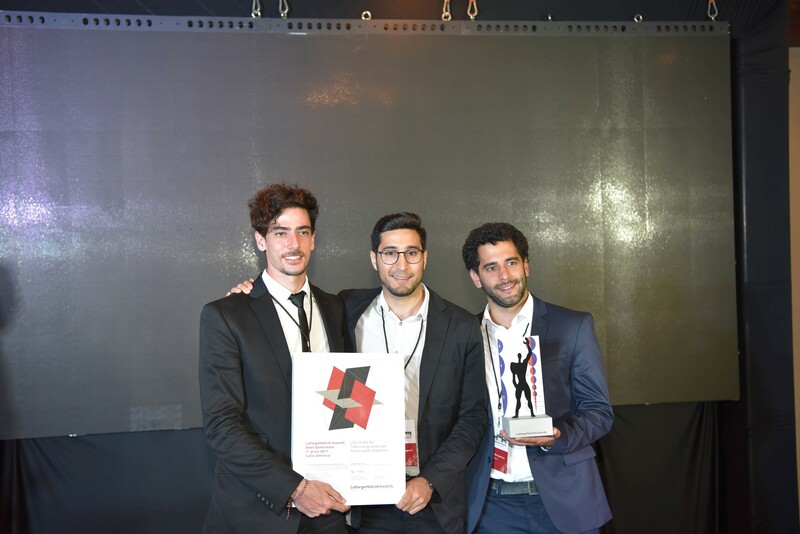 This category seeks visionary projects and bold ideas, and gives young professionals public exposure and a platform to gain recognition. 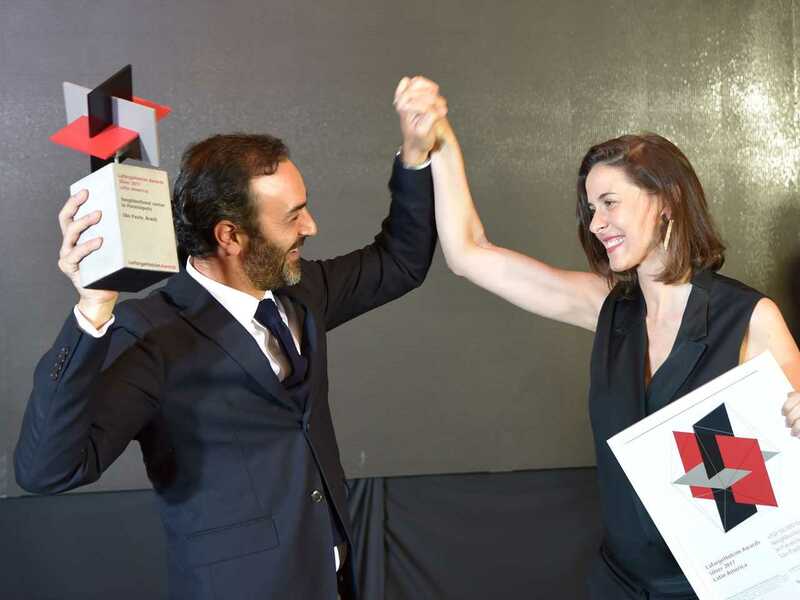 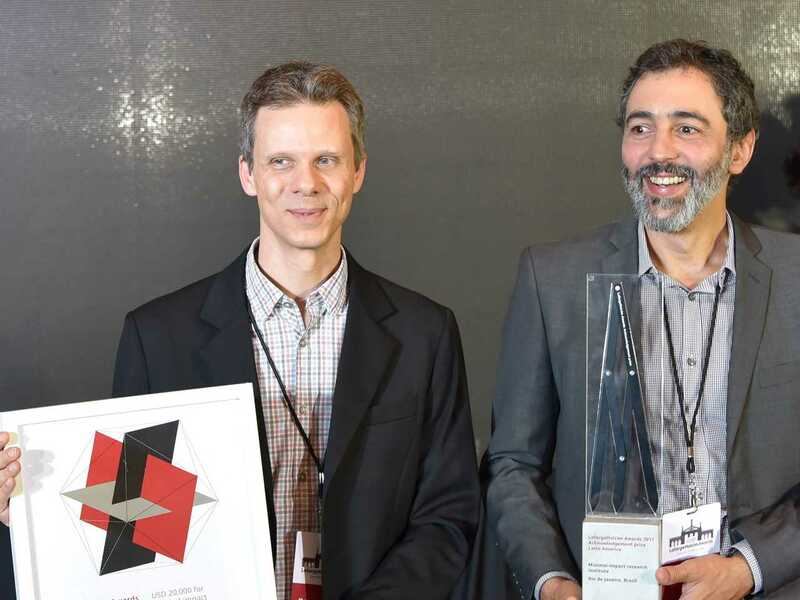 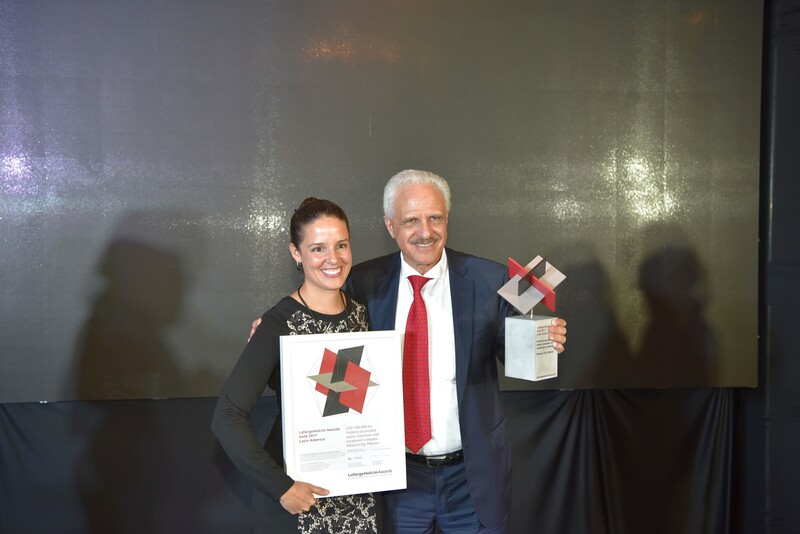 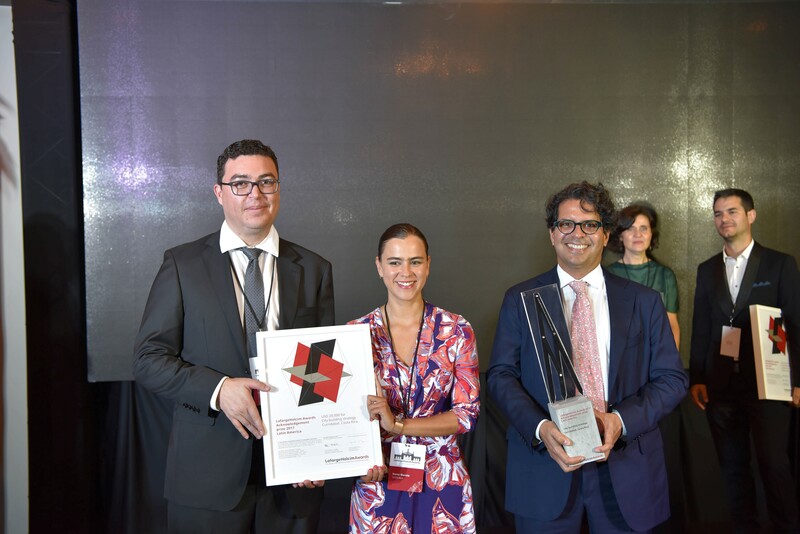 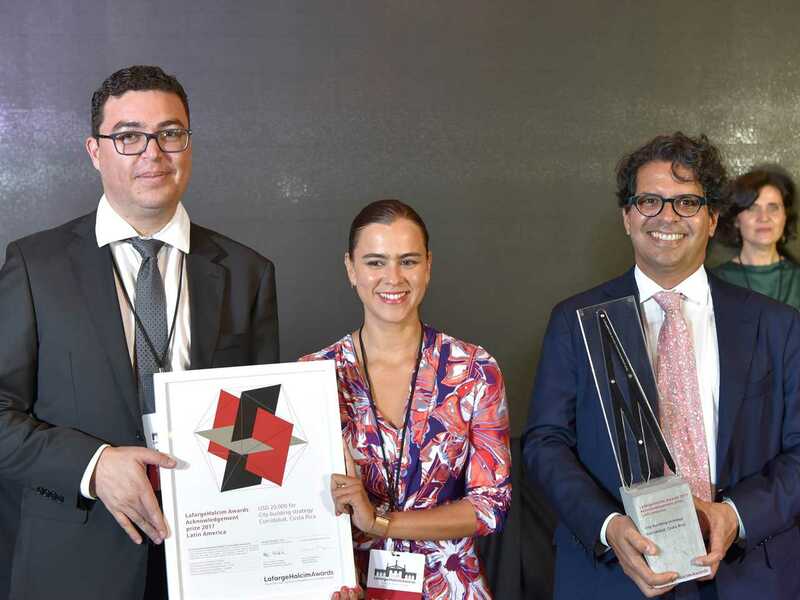 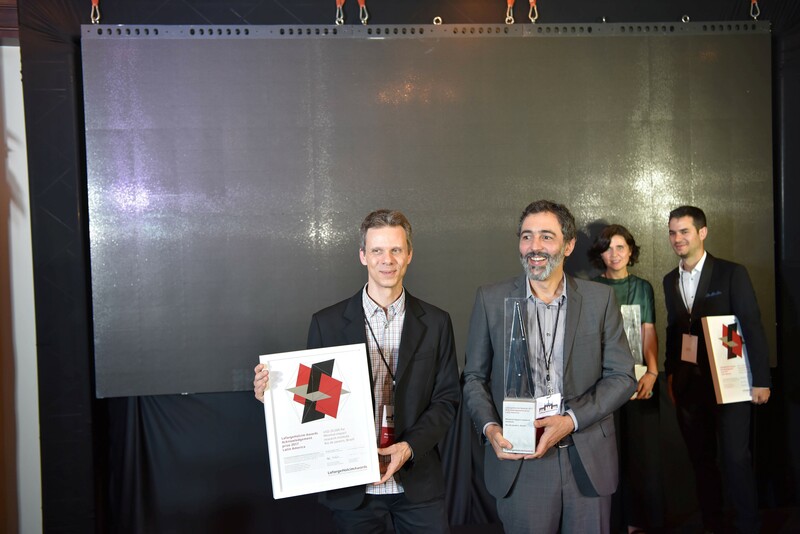 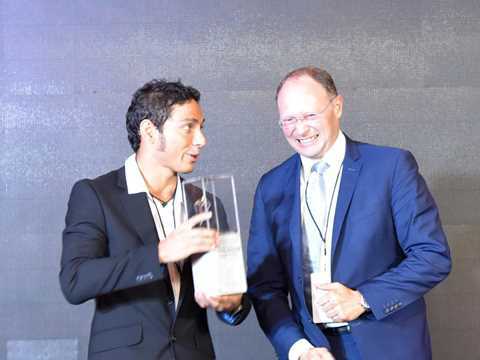 For the first time in the history of the LafargeHolcim Awards, more projects were submitted in the Next Generation category than in the main category. 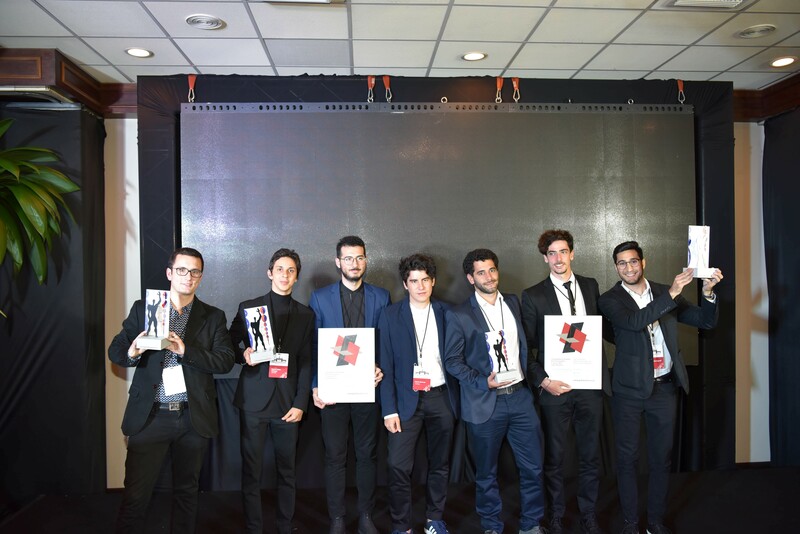 The first and the third Next Generation prizes went to teams from the Universidad Nacional de Córdoba in Argentina. 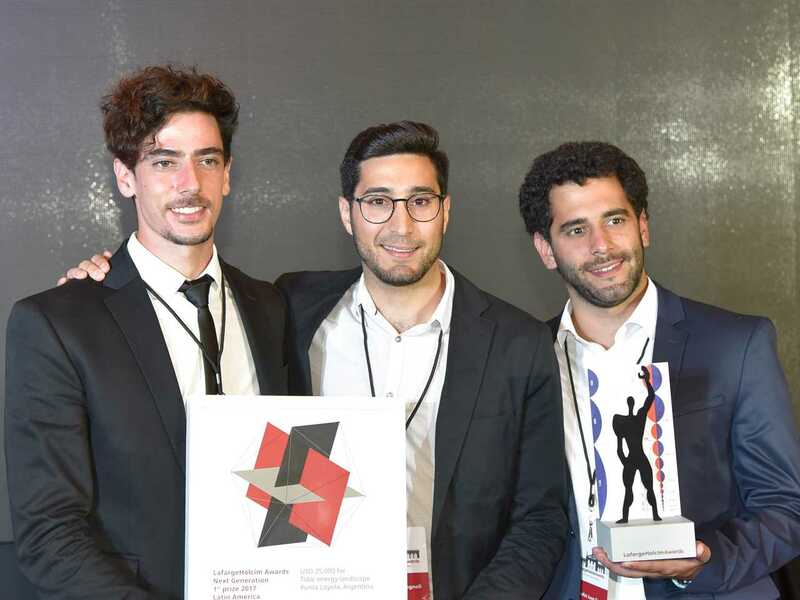 In first place were Stefano Romagnoli, Juan Cruz Serafini, and Tomás Pont Apóstolo, with a large-scale plan to harness tidal energy on the coast of Punta Loyola, Argentina. 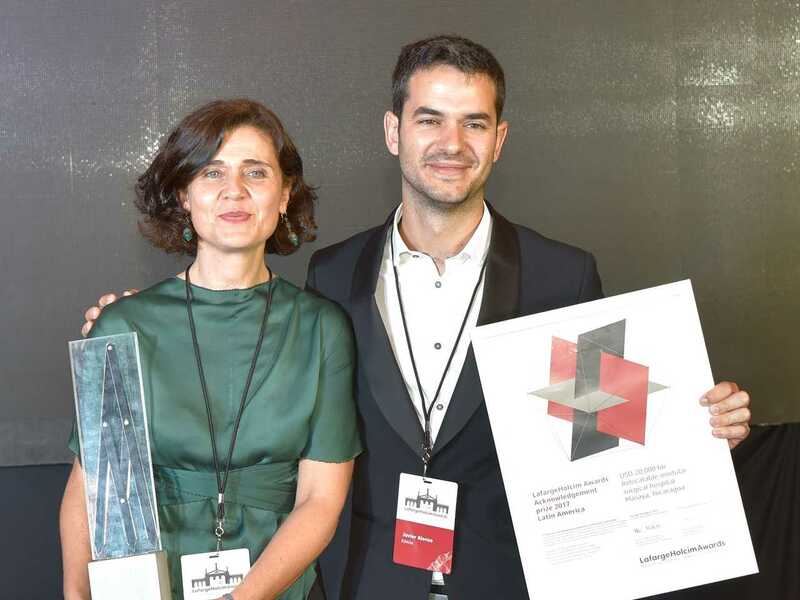 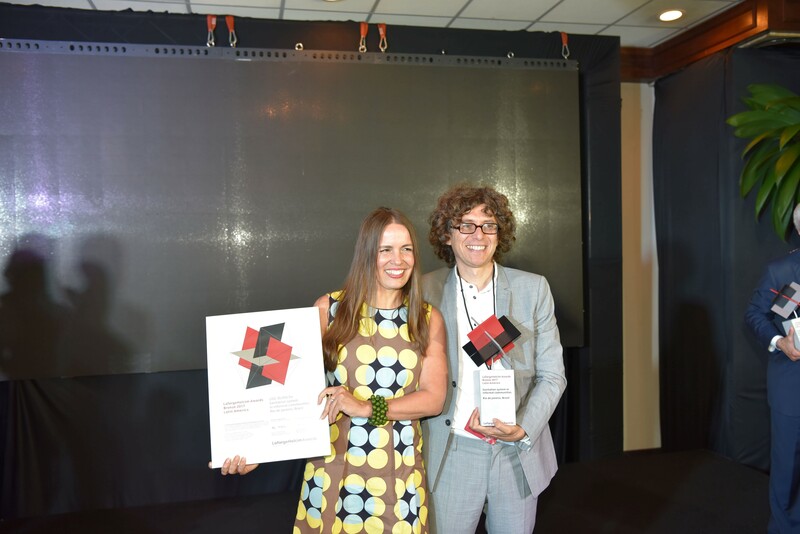 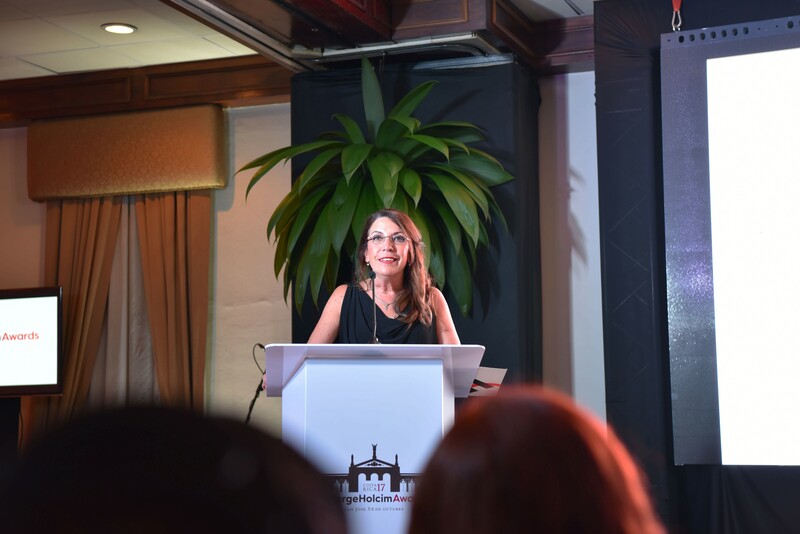 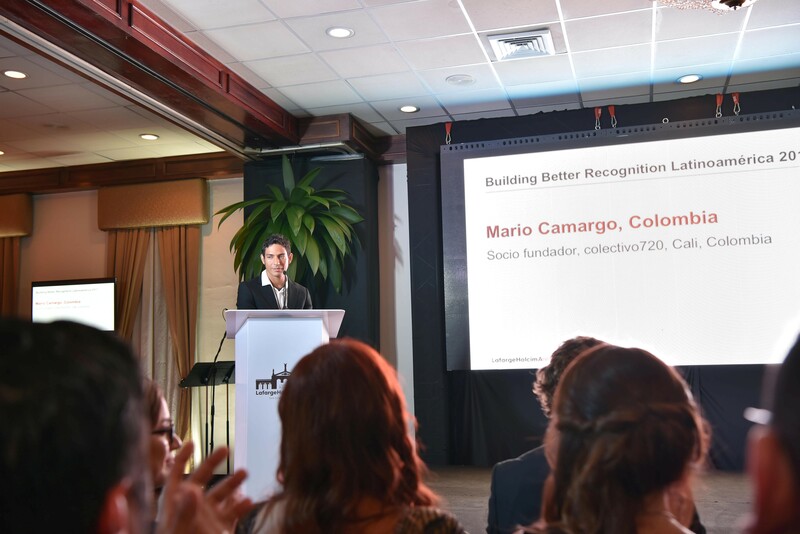 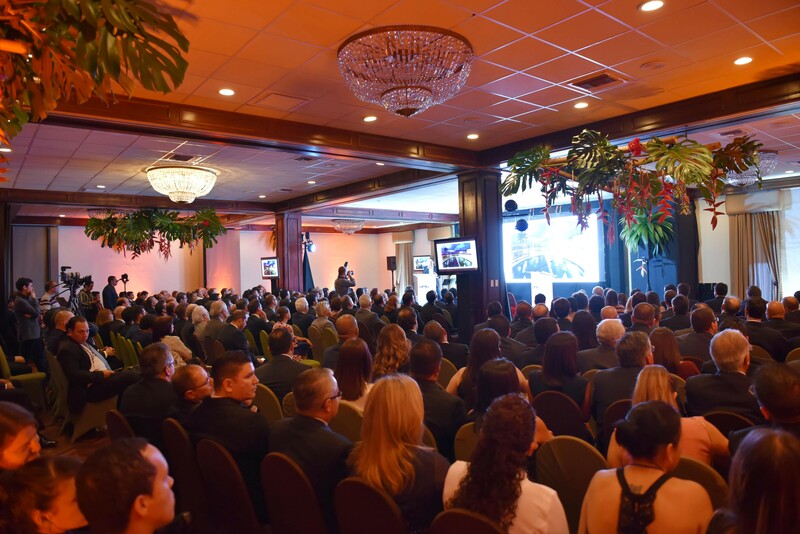 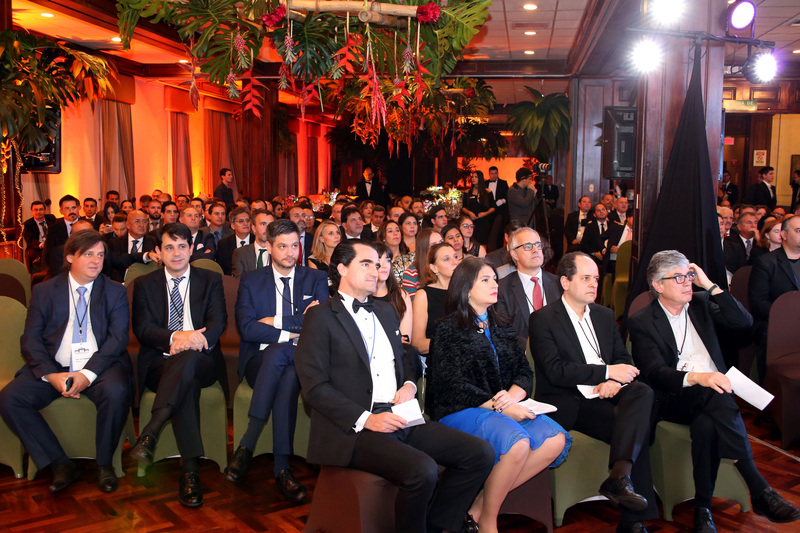 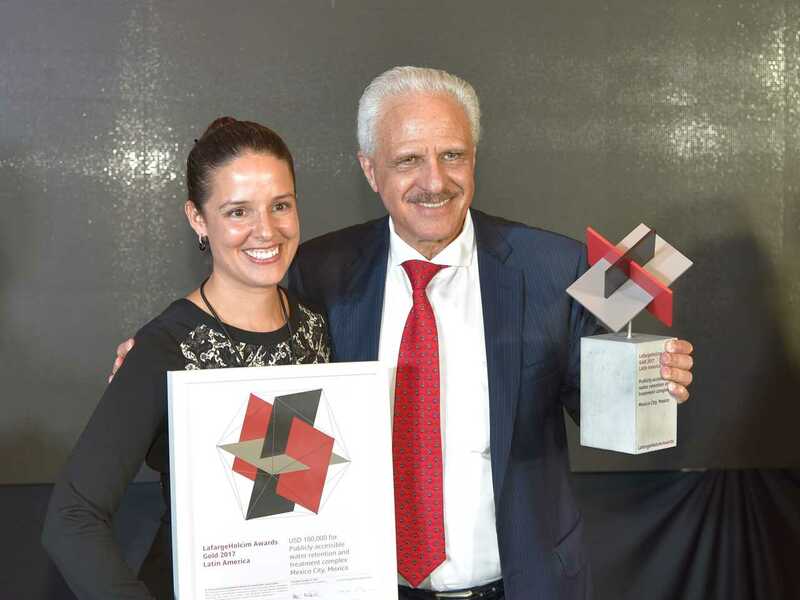 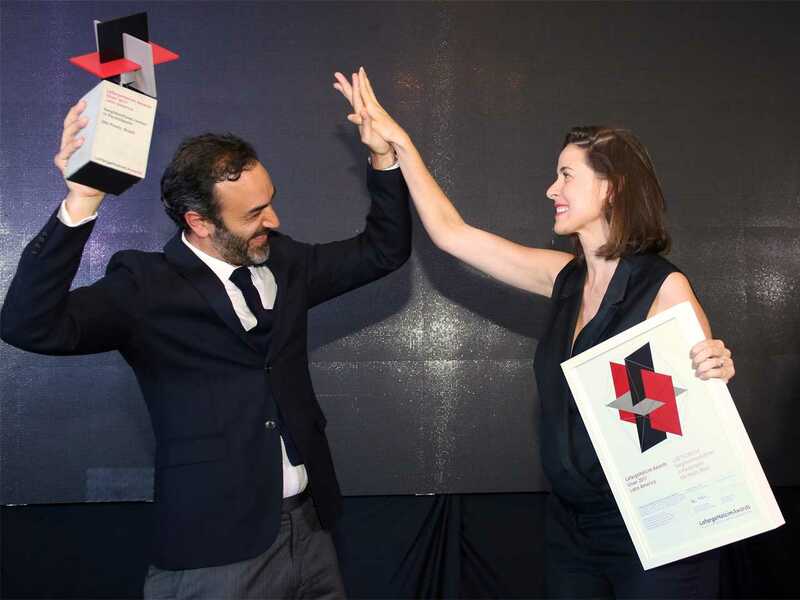 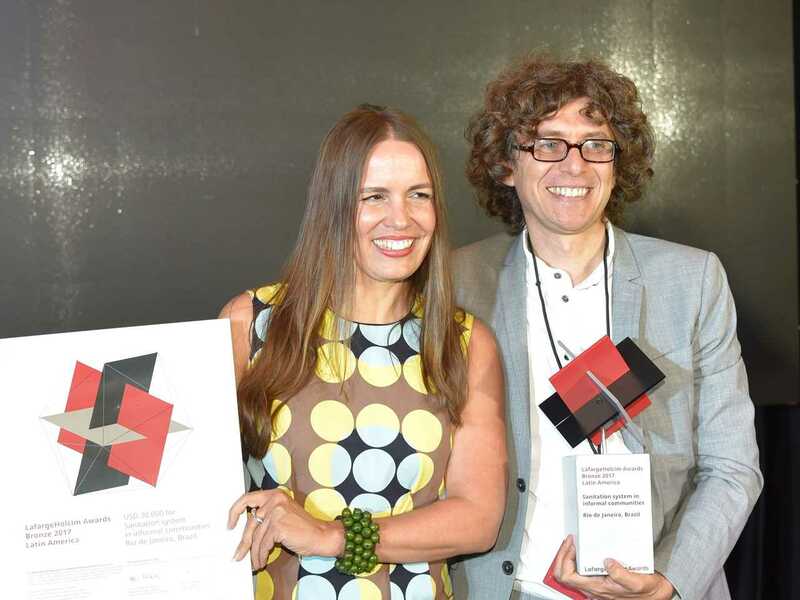 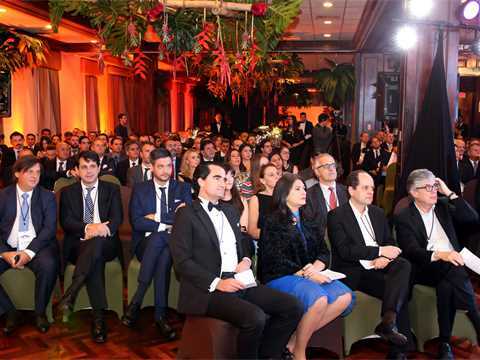 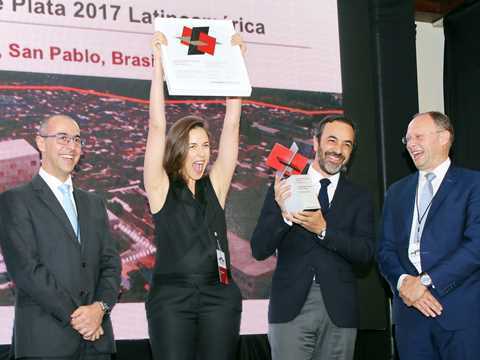 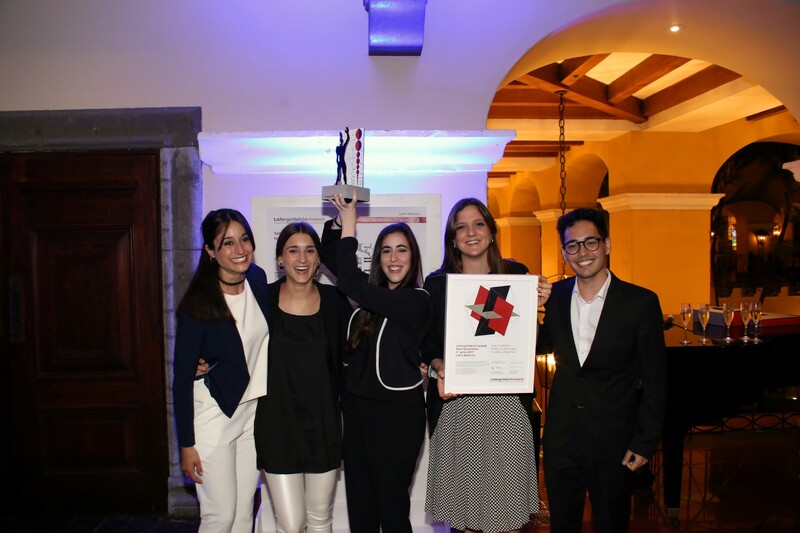 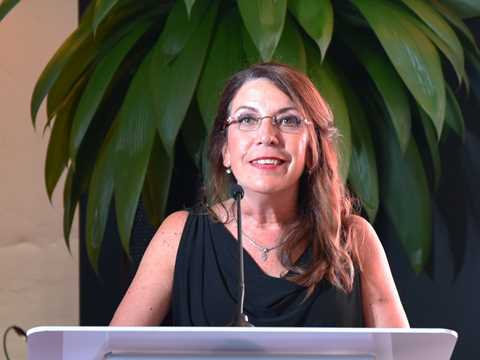 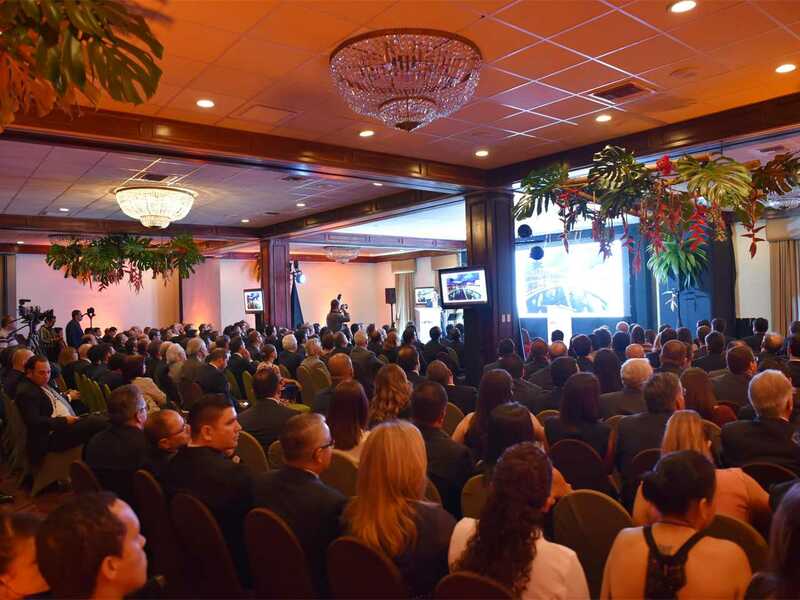 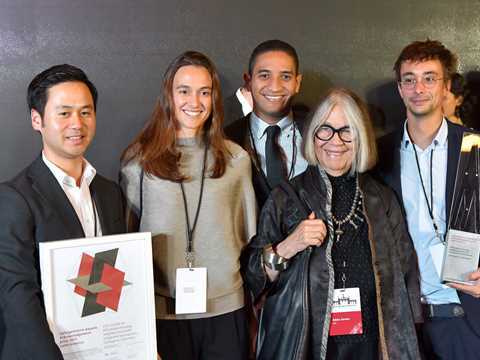 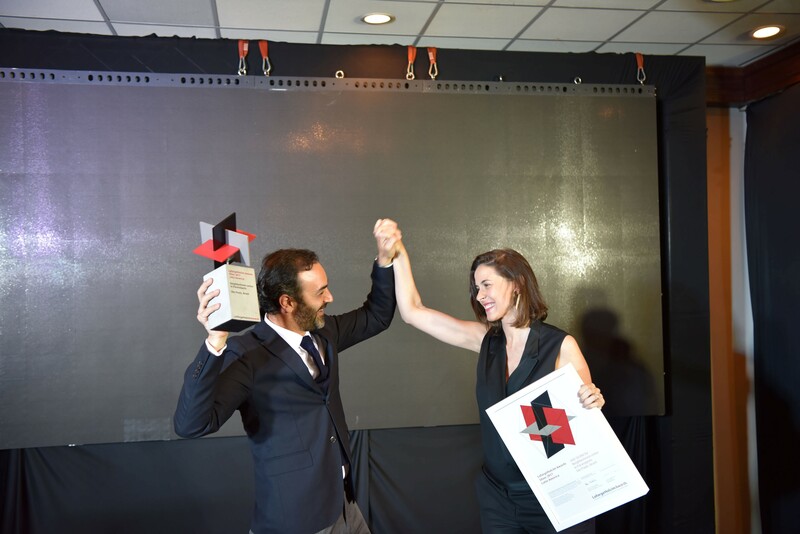 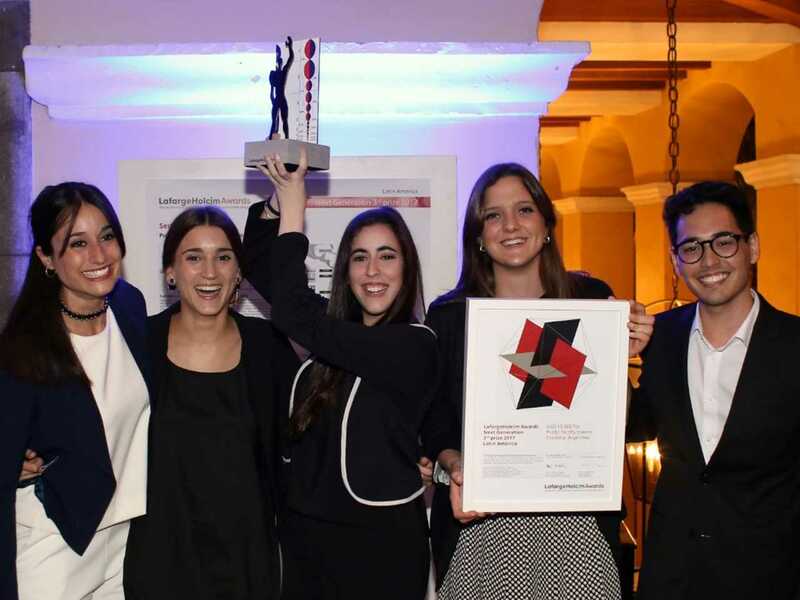 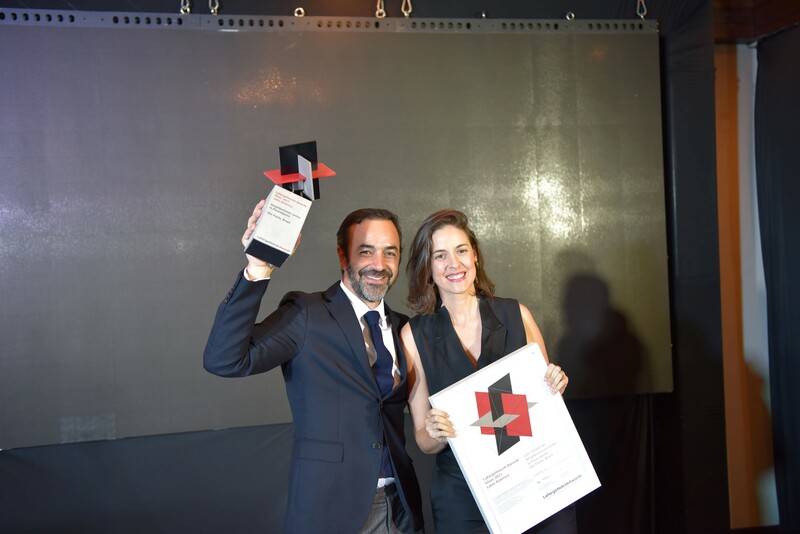 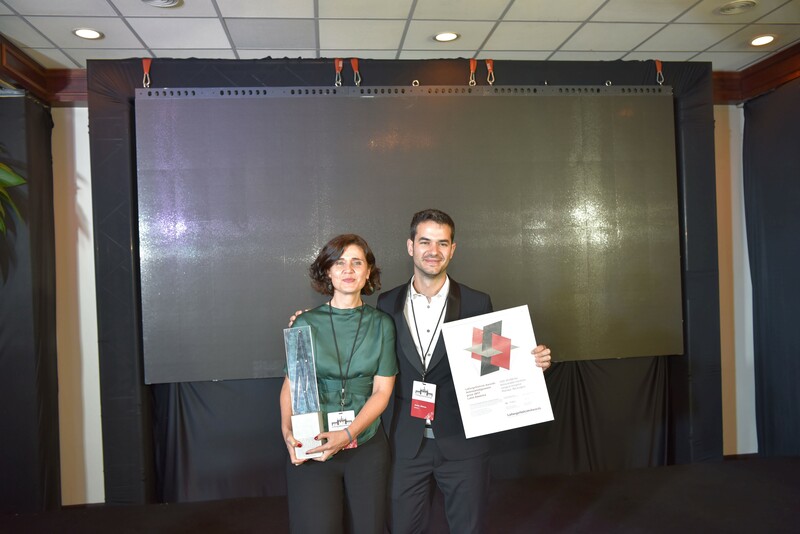 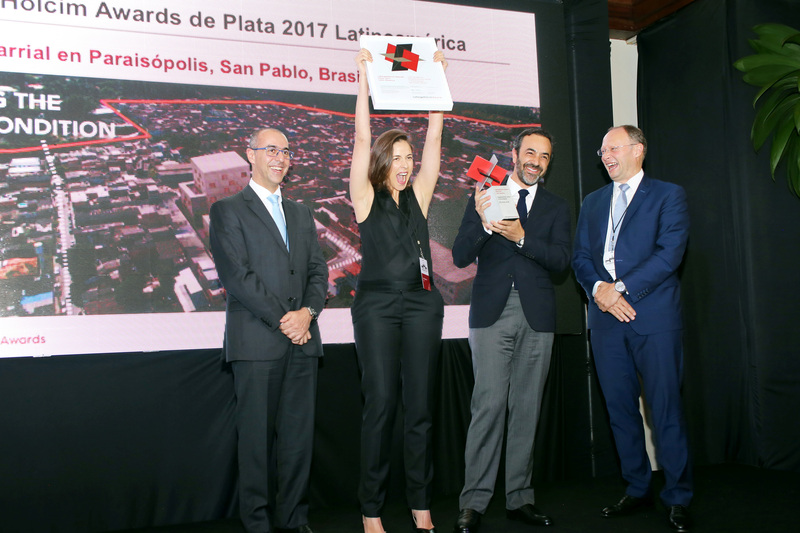 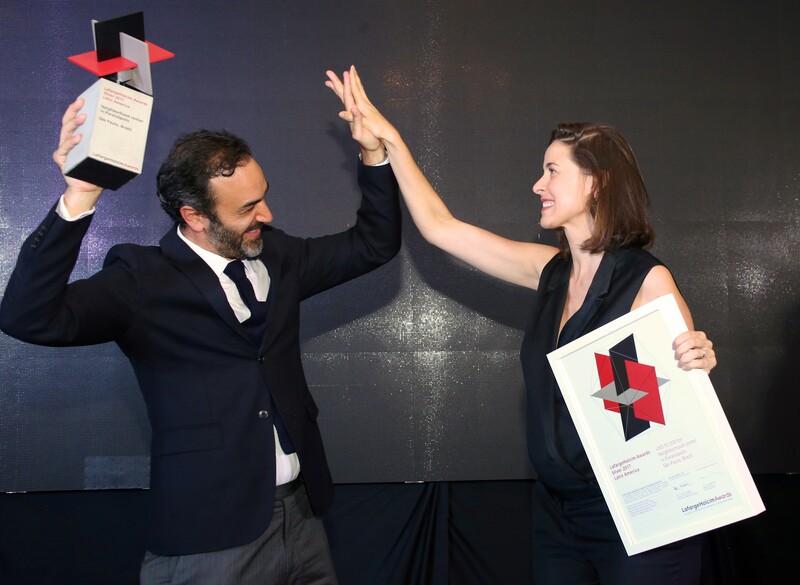 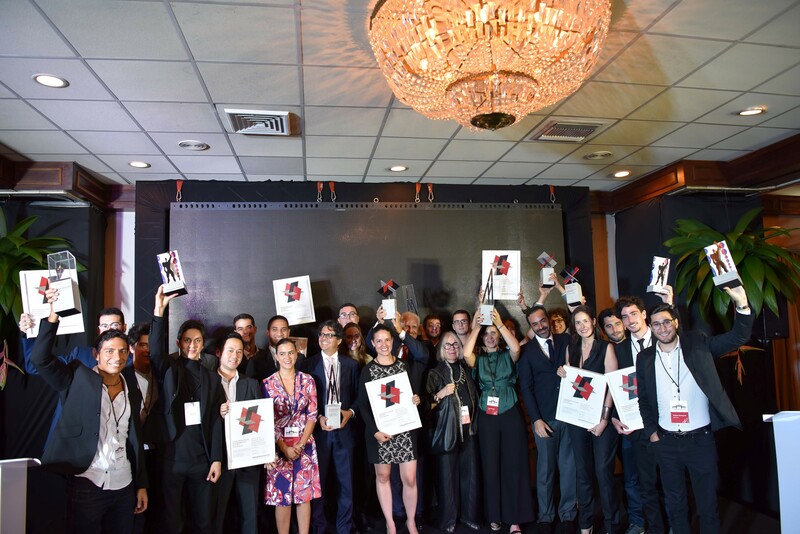 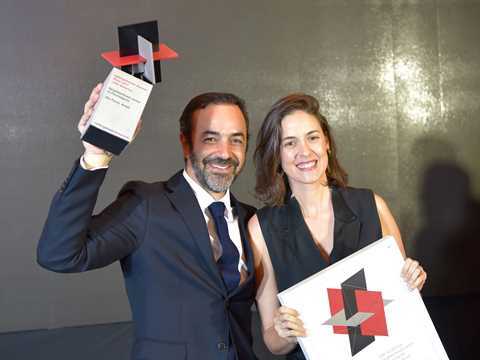 Their colleagues Ángela Ferrero, María Augustina Nieto, María Belén Pizarro, Seizen Uehara, and Lucía Uribe Echevarria were awarded for their Service Point Towers, with which they plan to offer services mainly for underprivileged residents of Latin American cities. 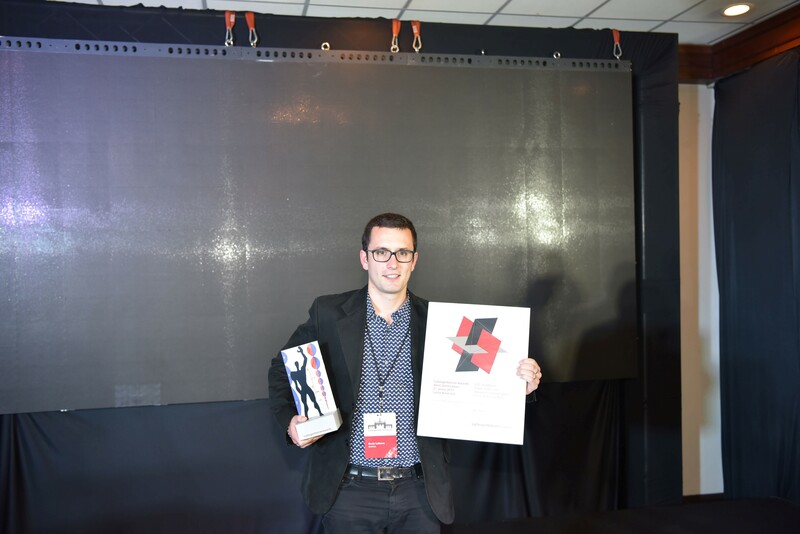 The second prize went to Boris Lefevre from France. 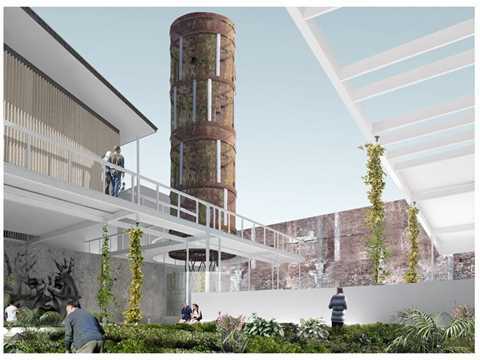 In Cerro de Pasco in Peru, he aims to unite two incompatible functions in one building: sewage treatment and public baths. 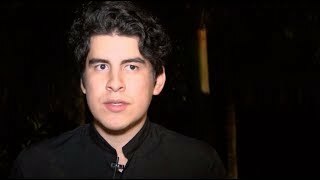 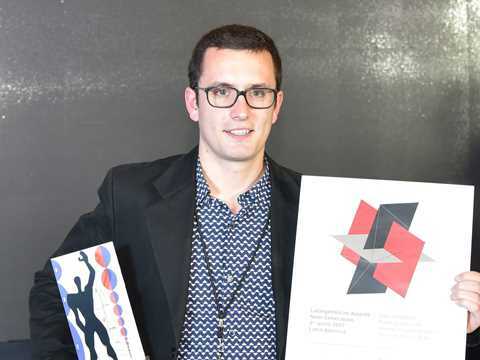 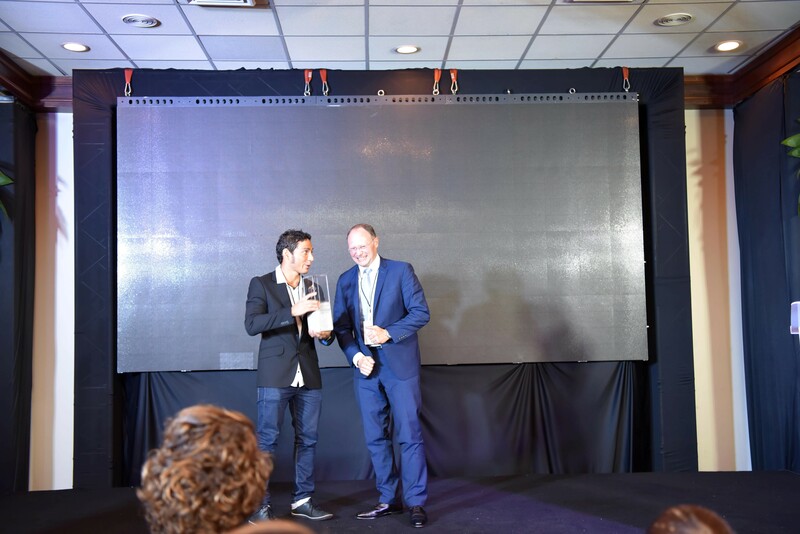 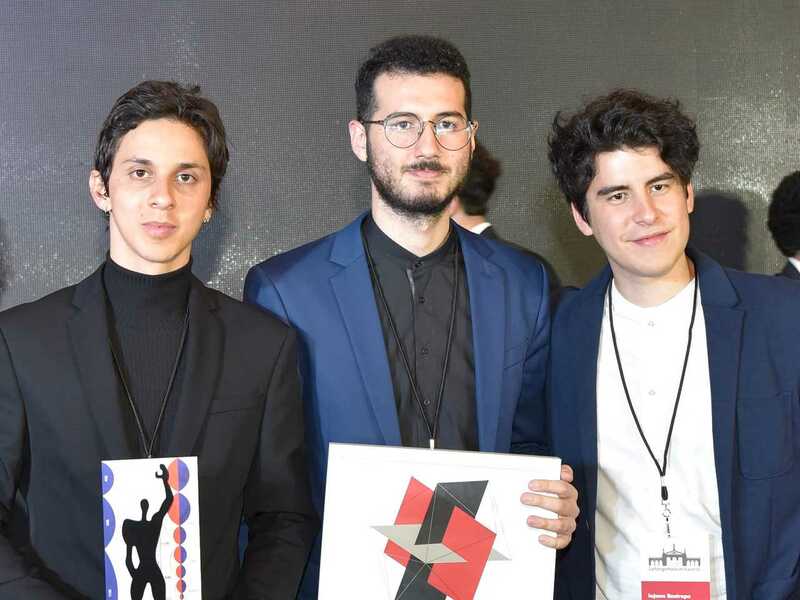 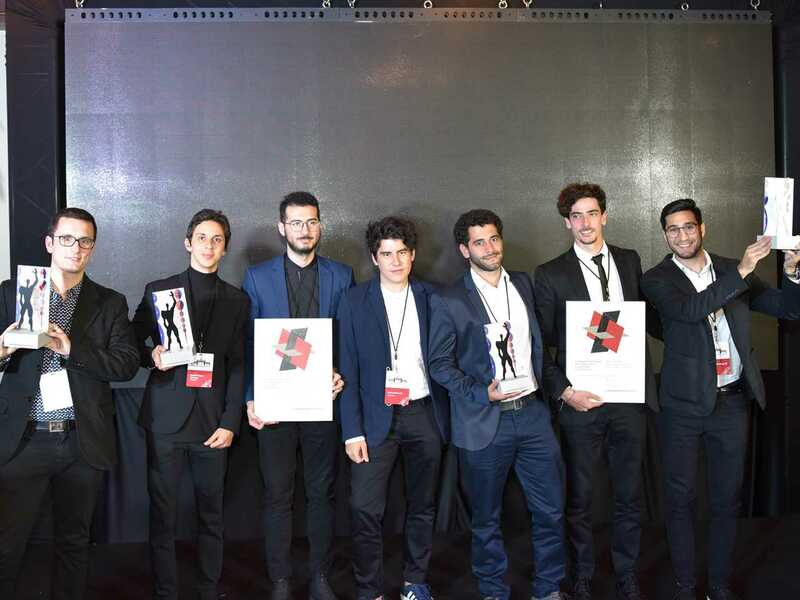 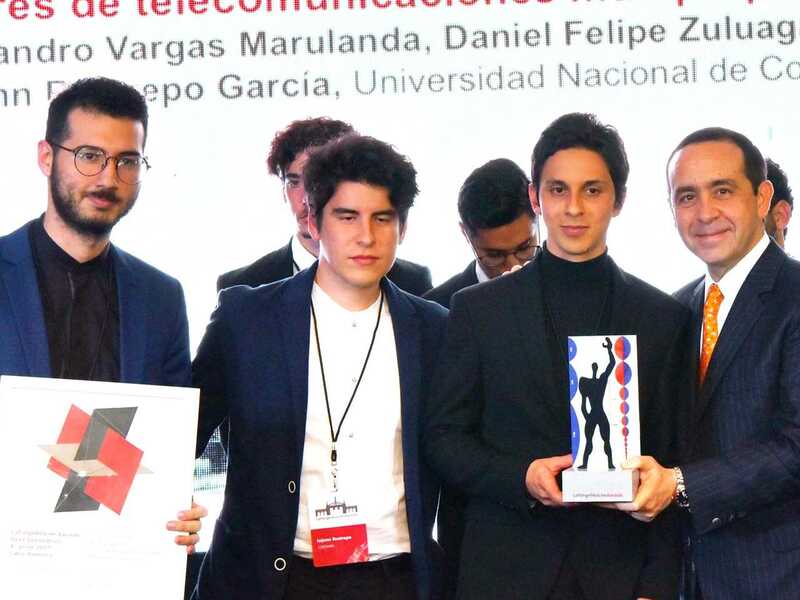 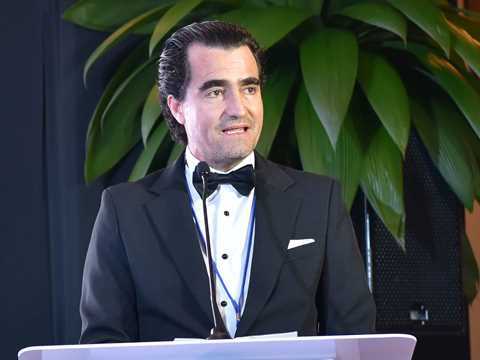 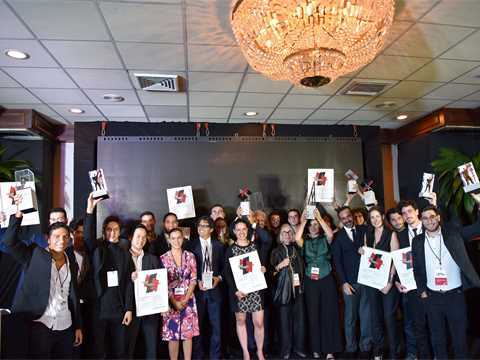 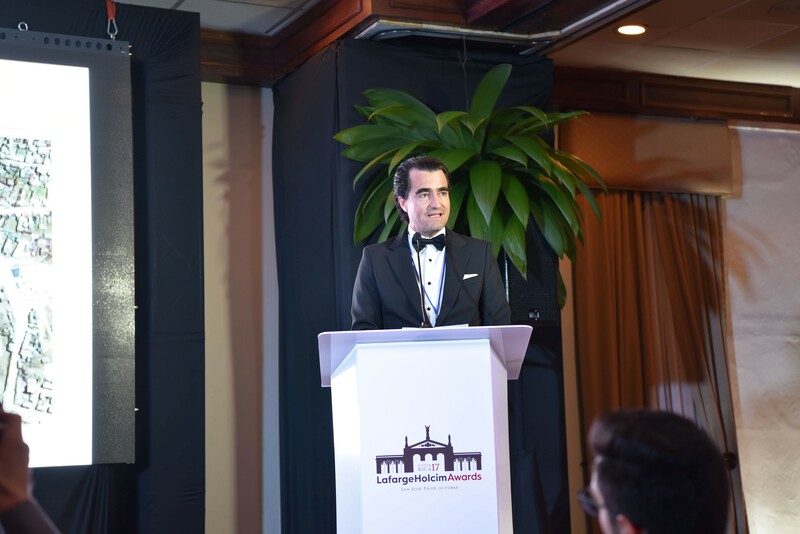 The fourth prize went to Alejandro Vargas Marulanda, Daniel Felipe Zuluaga Londoño, and Iojann Restrepo García from the Universidad Nacional de Colombia in Medellín, Colombia, for their design for flexible-use telecommunication towers in their city. Whether camouflaged or in plain view, mobile telephone telecommunication antennas are spreading across cities worldwide. 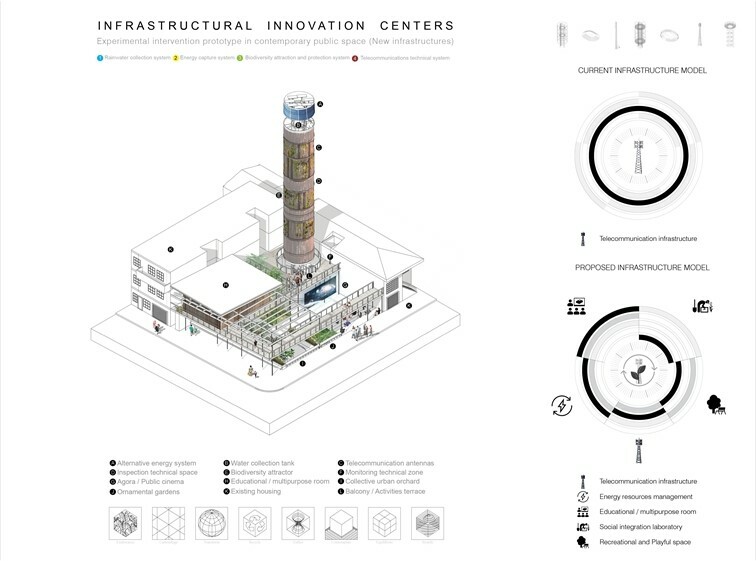 Questioning their mono-functionality, the project’s authors argue in favor of a strategy that would open up infrastructure to a broad palette of functions that could benefit communities, specifically those with insufficient public amenities. The design thus seeks to generate a novel network of public facilities attached to either existing or new telecommunication towers – appropriately so in Medellín, Colombia, a city undoubtedly open to innovation. 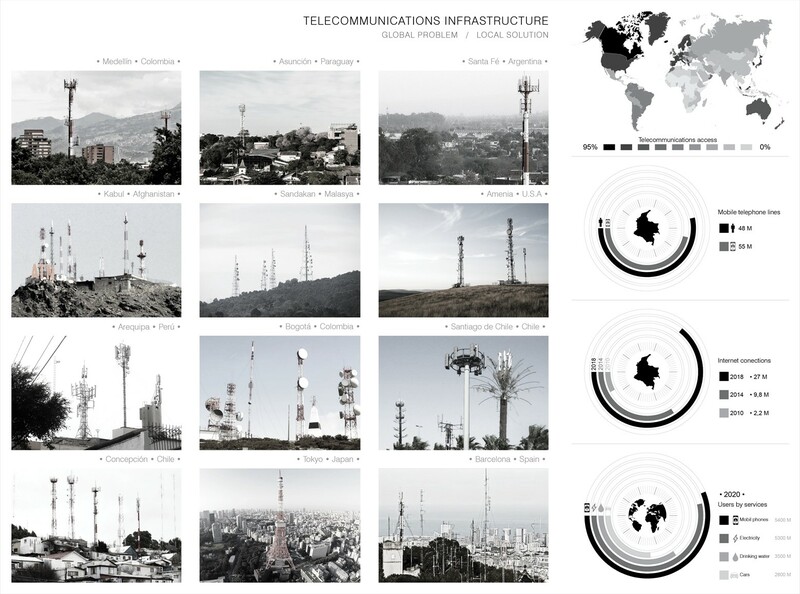 Currently, telecommunications are one of the main engines of global economic development. 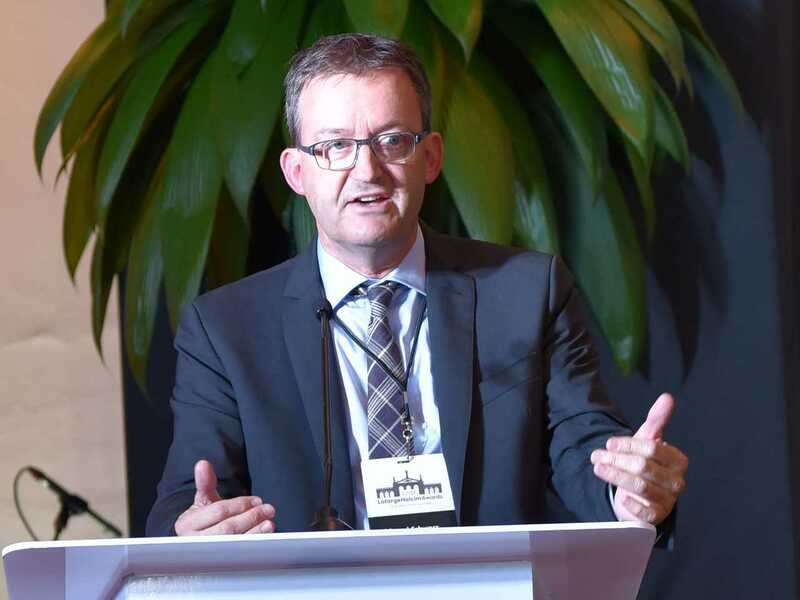 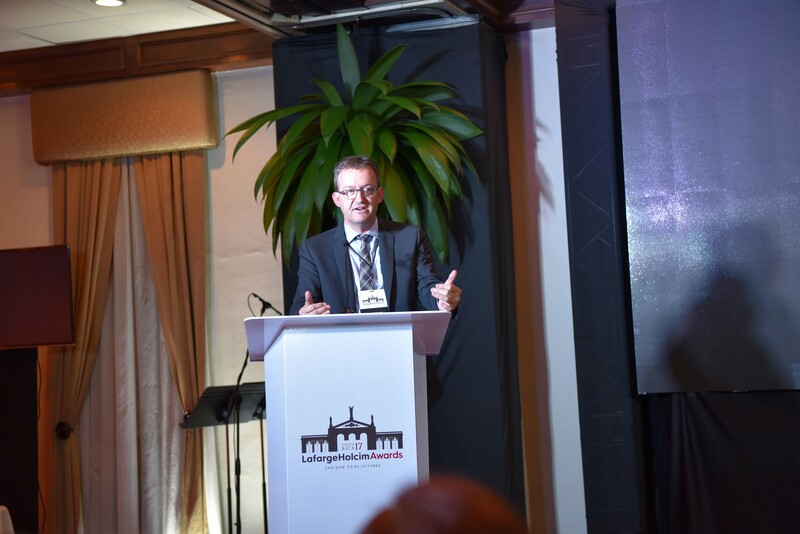 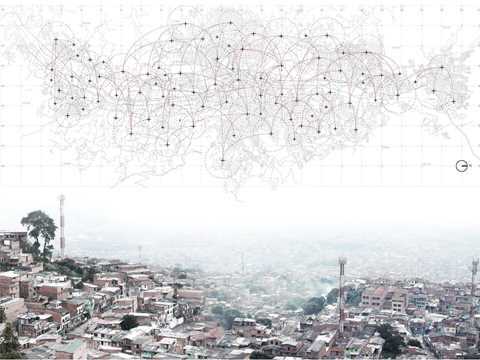 Since the arrival of the digital age it has generated an unprecedented increase in the number of infrastructures that have not been able to adapt physically or functionally in cities. 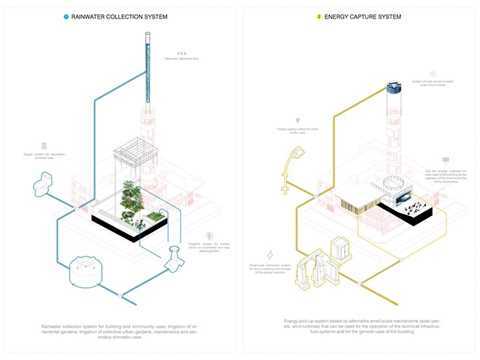 Recognizing that current and future lifestyles depend on these devices, we conceive a project that seeks to integrate these infrastructures and the spaces associated with them through social, landscape, architecture and urban interventions. 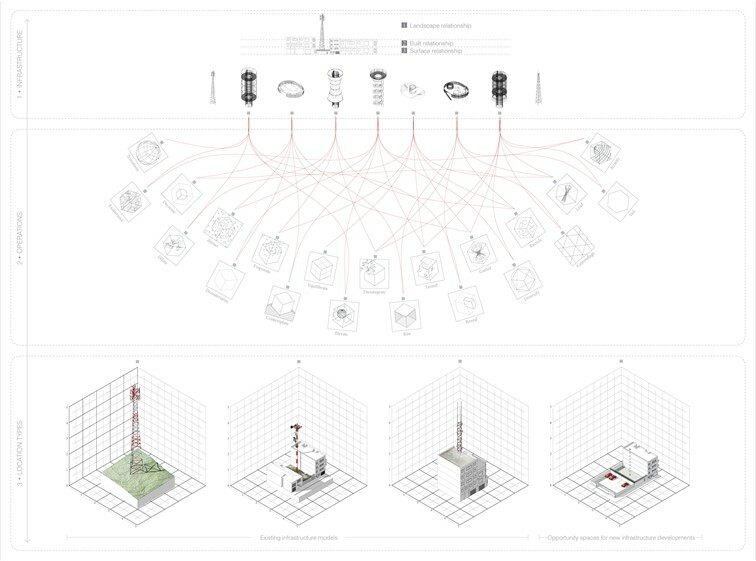 Our project creates replicable models which could be interpreted on a worldwide basis, giving a multidisciplinary, multi-scale and timeless response to this problematic. The proposed intervention models include existing infrastructure and provide alternatives for new developments. The project proposes the recovery of the large and unnecessarily closed spaces that these artifacts occupy for the creation of new public parks and small-scale facilities associated to telecommunication infrastructures. These interventions seek to understand the landscape, climatological, iconic and cultural conditions in each of the artifacts context, looking to create new spaces that promote social encounter, environmental education and cultural exchange between adjacent communities. 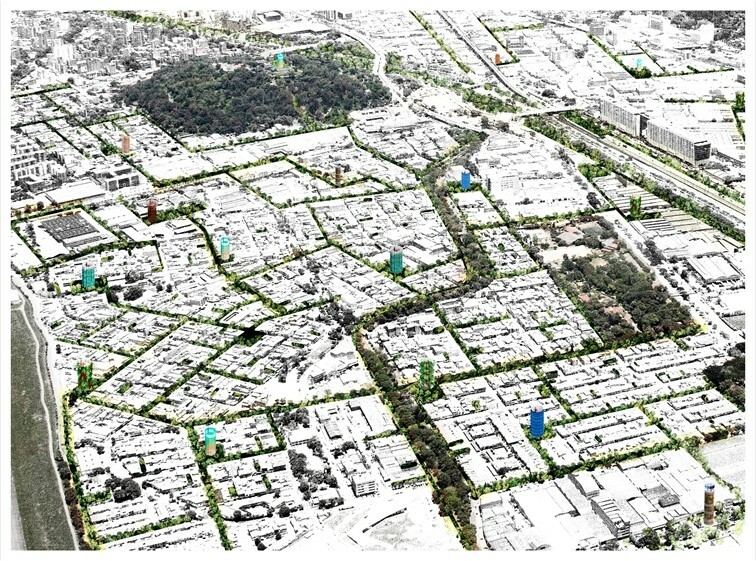 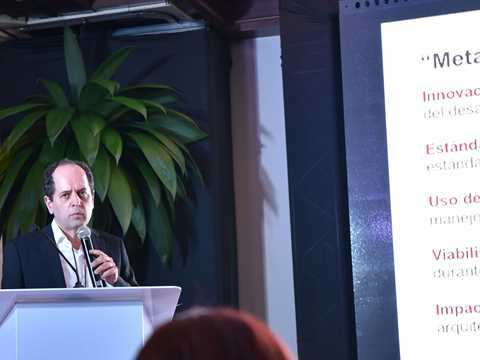 The project seeks to alleviate the existing public space deficit in the city (in Medellín there is barely 3.9 sq m per inhabitant, the ideal area according to WHO is 15 sq m), making it a small-scale public integration network that was previously hidden behind telecommunication infrastructures. Given the growing dependence on telecommunications and the national infrastructure deficit amounting to 12,000, we propose a new model that not only responds to technical parameters and aesthetics, but is capable of integrating the environment and providing resources for its operation through alternative energies. It also helps in consolidating a new aesthetic for this type of infrastructure, relating it with the materials and urban language of each place. Although the project entails a greater initial investment; the collection of rainwater for secondary uses, the collection and storage of energy and the implementation of community gardens, ensure that over time a very high percentage of the building can be operated and maintained with the activities that it stimulates.